Licensed from Superstition Recordings, Hamburg. 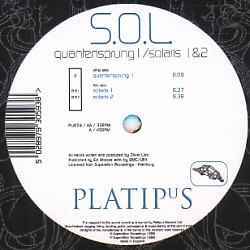 Solaris 1 is is by far the best mix off this 12'' & one of my all time favourite Lieb tracks, if you are into the old school Lieb sound then this is a must. Solaris 1 starts straight off with a standard 4/4 kick drum and tribal percussion but then at about 3 minutes in there is a breakdown of sorts as the overall vollume of the beats is decreased but then Lieb let's rip with what is sounds like a 4/4 bass tom over the 4/4 kicks & a sound like sonar which trails off after awhile but the combination of bass drum and bass tom that carries it through to it's conclusion, at times switching between cutting the kicks and keeping the toms and vice versa.